Cavin-Morris Gallery is pleased to announce Uncontained Excitement: Woven Sculpture from Japan, an exhibition opening June 28th, 2012 which will present the work of 14 sculptors who have expanded and veered from traditional craft, making sculpture rooted in basketry, but using organic and inorganic materials not part of the basket heritage of Japan. Few of these works are strictly functional. None of the artists have been previously shown in the United States. This group represents the second, third and fourth generation of artists breaking away from traditional bamboo forms, who use materials ranging from palm fronds to sheets of industrial plastic and paper packing tape. Some of the artists were inspired by, or were students of Chizu Sekiguchi, who herself was inspired by Hisako Sekijima (not in the exhibition) who came to the US in the late 1970’s and was herself inspired to push the envelope by the work of Ed Rossbach, John McQueen, and Kay Sekimachi. Rossbach was one of the first artists to recognize and push the best of the field of New Basketry as fine Contemporary Art. This is still not an easy path in either the East or West. This exhibition allows a group of smaller works to speak volumes for these new sculptural forms, astonishing in their wide range and conceptual complexity. Included will be: Michiko Fukai, Yasuko Hoshino, Sachiko Itabashi, Ritsuko Jinnouchi, Mieko Kawase, Yukari Kikuchi, Shigeru Matsuyama, Akiko Mio, Hiroko Okuno, Shizuko Takahashi, Mayumi Tsukuda, Nobuko Ueda, and Emiko Yoshiya. Cavin-Morris Gallery is pleased to announce an exhibition of ceramic sculpture called THE CONTEMPORARY ART OF THE CHAWAN: An International Invitational. 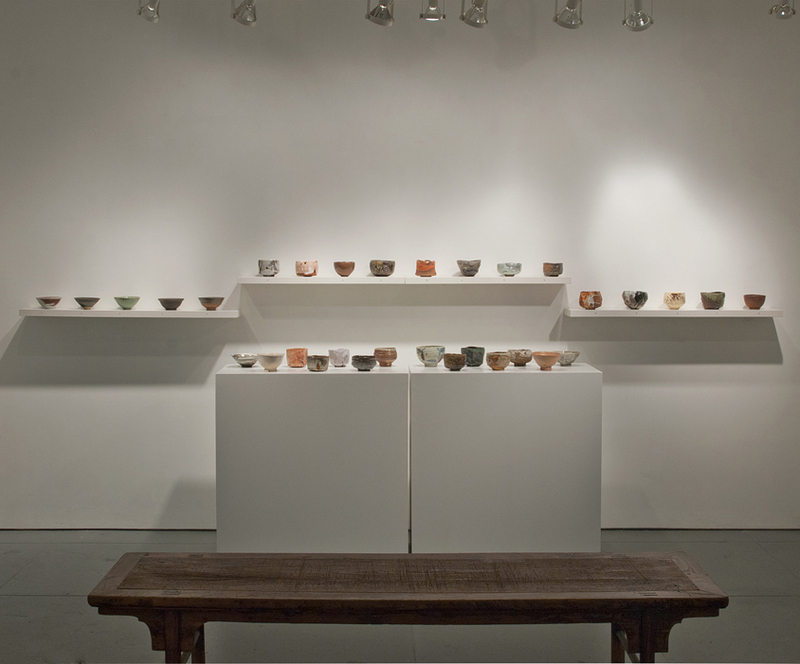 The core of this exhibition comes from a show organized by Robert Fornell and Rick Mahaffey for NSECA called Teaware From the Edge. Both artists have work in the exhibition. We decided to expand the show at Cavin-Morris to include some other sculptors from around the world, focusing on the plastic possibilities of working originality into a revered form. The chawan has always fascinated us with its references to history, to the possibilities of clay, and to the idea of the teabowl as a spiritual vessel and device containing sacred space; a doorway to contemplation of wabi aesthetics and impermanence, of yugen (mysterious beauty), nature and landscape and place, and the idiosyncratic vision of the artist him or herself. Included will be the work of John Benn, Richard Bresnahan, Peter Callas, Tom Charbit, Woong Taek Choi, John Dix, Paul Drapkin, Judith Duff, Robert Fornell, Gyozo Furuse, Lisa Hammond, Shigamasa Higashida, Chuck Hindes, Osamu Inayoshi, Ki Bong Jeong, Kentaro Kawabata, Sun Sik Kim, Young Sik Kim, Ryoji Koie, Lucien Koonce, Derek Larsen, Jung Hwan Lee, Kang Hyo Lee, Rick Mahaffey, Touri Maruyama, Hideo Matsumoto, Shozo Michikawa, Richard Milgrim, Young Ki Min, Dan Murphy, Soon Taek Oh, Toshio Ohi, Takao Okazaki, Reid Ozaki, David Pike, Phil Rogers, Tim Rowan, Tae Kwan Ryu, Akira Satake, Steve Sauer, Jeff Shapiro, Fumio Shimada, Wasaburo Takahashi, Takashi Tanaka, Yoh Tanimoto, Kai Tsujimura, Shiro Tsujimura, and Mike Weber.